Good times - its moments like these that make me think time is the most precious thing in life. Kids won't stay kids and everyone won't be on earth forever. 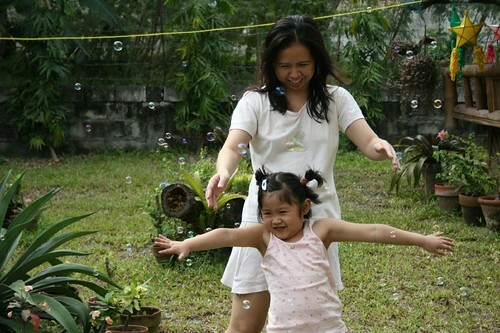 This is a picture of me and my niece Anya, they are flying away again after 2 weeks but at least I got my share of good times - playing bubbles in our yard, senseless shopping with my sister, and feeling just like 2 years ago. Anya was staying with us until they left for Australia 2 years ago. Anya is addicted to cars, can ask 10 questions in 1 minute, and has unlimited energy resource. 2008 looks promising for an Aquarian like me, that is, according to the stars. I've been busy with work but very happy and looking forward for things to come. A percentage of my brain and heart though is preoccupied with the thought of not having to see my sister and niece for another year or two. Changes are scary but if people want to reach some goals, you have to make make space and time for new things to come. 1. to be able to afford to pay for another driver so he can drive me to work everyday. Right now I'm sharing rides with my sister Liza and I have to step down in Taft avenue to take the MRT. I want more time too so if I can finally afford to hire another driver, I can get home faster. haha that's just a wild dream and i'll work hard to achieve this. 2. Then I like world peace, i wish everybody gets a job and love it too, and I wish to make my family happy. 3. 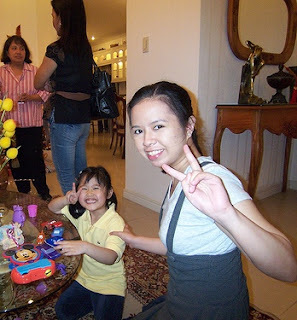 I wish Anya can stay here in the Philippines with me forever. So list down your 2007 good times and your dreams for 2008. If you can dream/write it, you can achieve it! If you can dream it, you can have it. What works for me was listing my goals in paper and making plans around that goal. Anyway, good luck to your dreams. Hope you are blessed.